The U.S. government does not track death rates for every drug. However, the National Center for Health Statistics at the Centers for Disease Control and Prevention does collect information on many of the more commonly used drugs. The CDC also has a searchable database, called CDC Wonder. Figure 1. 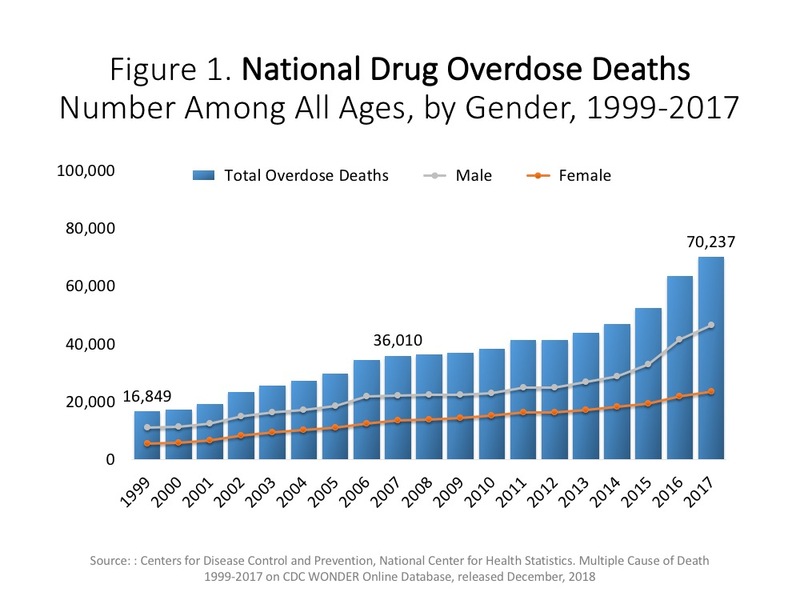 National Drug Overdose Deaths—Number Among All Ages, by Gender, 1999-2017. More than 70,200 Americans died from drug overdoses in 2017, including illicit drugs and prescription opioids—a 2-fold increase in a decade. The figure above is a bar and line graph showing the total number of U.S. overdose deaths involving all drugs from 1999 to 2017. Drug overdose deaths rose from 16,849 in 1999 to 70,237 in 2017. The bars are overlaid by lines showing the number of deaths by gender from 1999 to 2017 (Source: CDC WONDER). Figure 3. 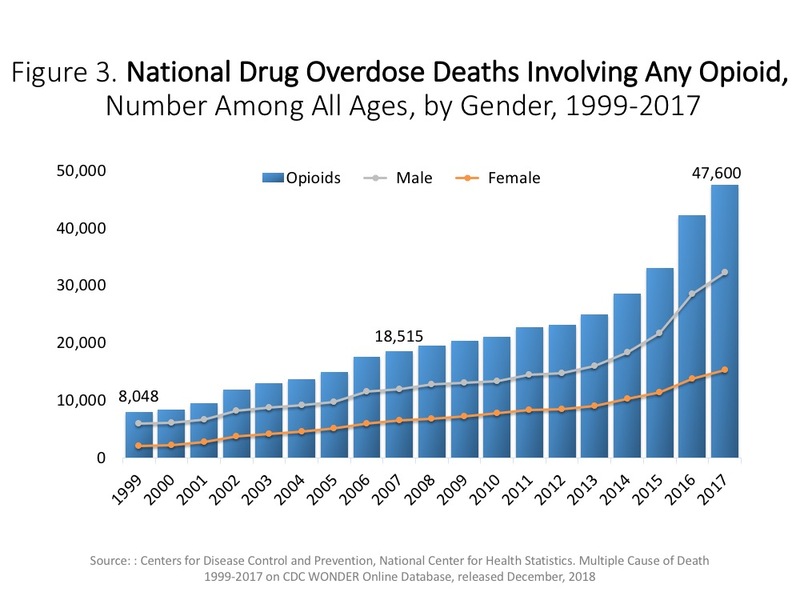 National Overdose Deaths Involving Any Opioid—Number Among All Ages, by Gender, 1999-2017. The figure above is a bar and line graph showing the total number of U.S. overdose deaths involving opioids from 1999 to 2017. Any opioids includes prescription opioids (and methadone), heroin and other synthetic narcotics (mainly fentanyl). Drug overdose deaths rose from 8,048 in 1999 to 47,600 in 2017. The bars are overlaid by lines showing the number of deaths by gender from 1999 to 2017. Overall, there has been a higher number of drug overdose deaths among males. (Source: CDC WONDER). Figure 4. National Overdose Deaths Involving Prescription Opioids—Number Among All Ages, 1999-2017. The figure above is a bar and line graph showing the total number of U.S. overdose deaths involving prescriptions opioids (including methadone) from 1999 to 2017. Drug overdose deaths involving prescription opioids rose from 3,442 in 1999 to 17,029 in 2017. Since 2016, however, the number of deaths have remained stable. The bars are overlaid by lines showing the number of deaths involving prescription opioids in combination with other synthetic narcotics (mainly fentanyl) and without other synthetic narcotics from 1999 to 2017. 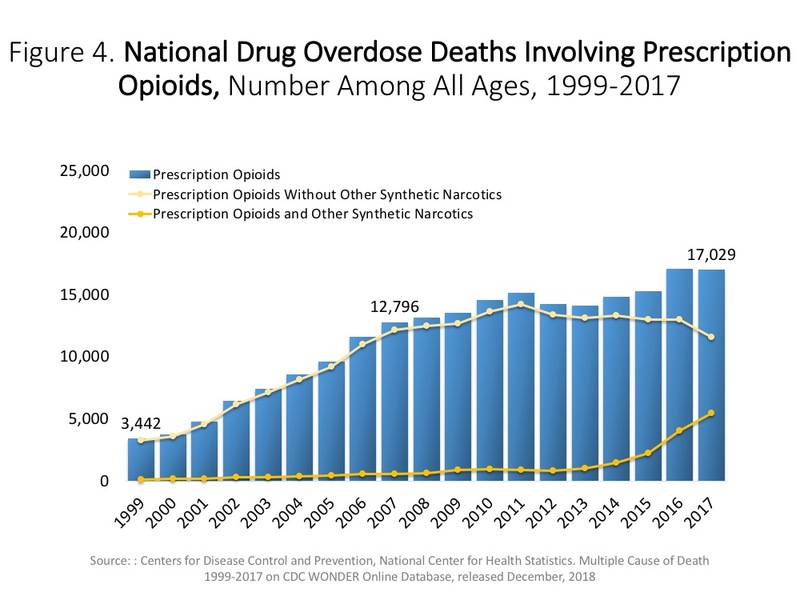 The number of deaths involving prescription opioids in combination with synthetic narcotics has been increasing steadily since 2014 and shows that the increase in deaths involving prescription opioids is driven by the use of fentanyl (Source: CDC WONDER). Figure 5. National Overdose Deaths Involving Heroin—Number Among All Ages, 1999-2017. The figure above is a bar and line graph showing the total number of U.S. overdose deaths involving heroin from 1999 to 2017. Drug overdose deaths involving heroin rose from 1,960 in 1999 to 15,482 in 2017. The bars are overlaid by lines showing the number of deaths involving heroin in combination with other synthetic narcotics (mainly fentanyl) and without other synthetic narcotics from 1999 to 2017. 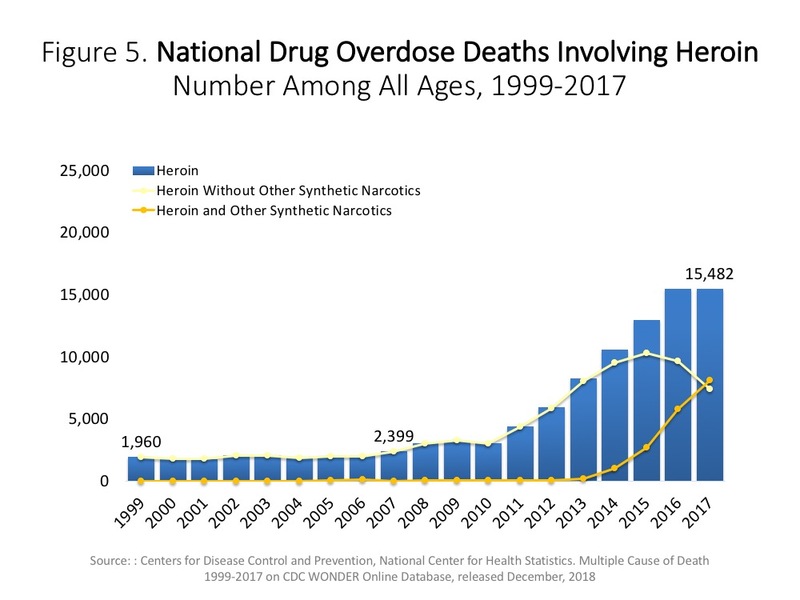 The number of deaths involving heroin in combination with synthetic narcotics has been increasing steadily since 2014 and shows that the increase in deaths involving heroin is driven by the use of fentanyl (Source: CDC WONDER). Figure 6. National Drug Overdose Deaths Involving Psychostimulants With Abuse Potential (Including Methamphetamine), by Opioid Involvement, Number Among All Ages, 1999-2017. The figure above is a bar and line graph showing the total number of U.S. overdose deaths involving psychostimulants from 1999 to 2017. Drug overdose deaths rose from 547 in 1999 to 10,333 in 2017. The bars are overlaid by lines showing the number of deaths involving psychostimulants and any opioid, psychostimulants without any opioid, and psychostimulants and other synthetic narcotics. 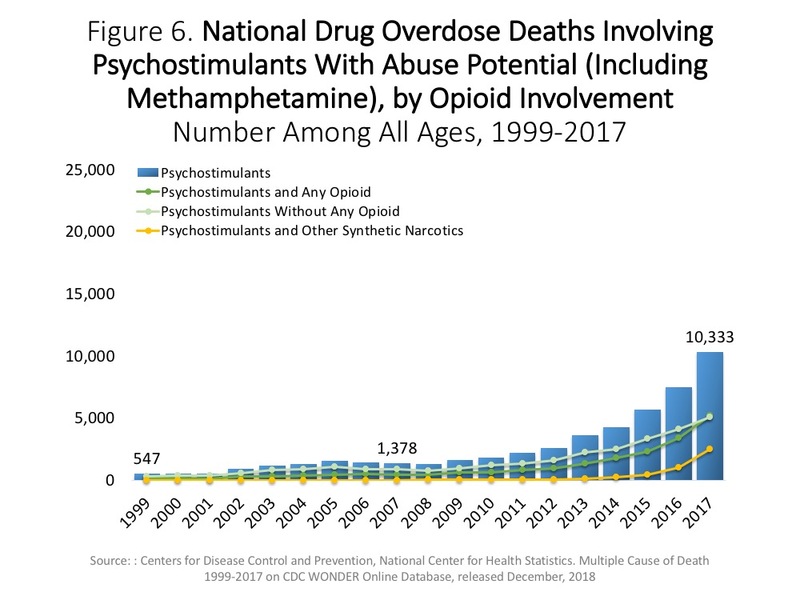 The number of deaths involving the combination of psychostimulants with any opioid has been increasing steadily since 2014 and is mainly driven by the involvement of other synthetic narcotics; however, deaths involving psychostimulants without the involvement of any opioid are also on the rise (Source: CDC WONDER). Figure 7. National Drug Overdose Deaths Involving Cocaine, by Opioid Involvement–Number Among All Ages, 1999-2017. The figure above is a bar and line graph showing the total number of U.S. overdose deaths involving cocaine from 1999 to 2017. Drug overdose deaths involving cocaine rose from 3,822 in 1999 to 13,942 in 2017. The bars are overlaid by lines showing the number of deaths involving cocaine and any opioid, cocaine without any opioid, and cocaine and other synthetic narcotics. 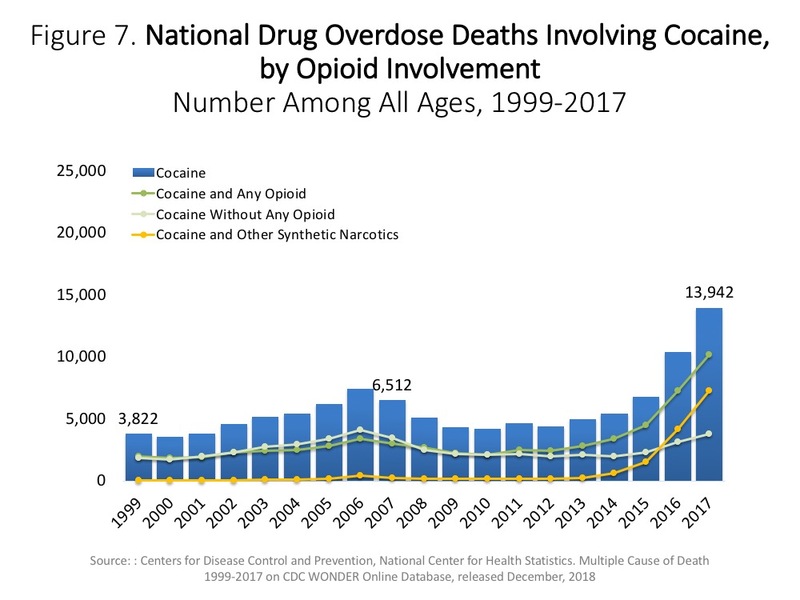 The number of deaths in combination with any opioid has been increasing steadily since 2014 and is mainly driven by deaths involving cocaine in combination with other synthetic narcotics (Source: CDC WONDER). Figure 8. National Drug Overdose Deaths Involving Benzodiazepines, by Opioid Involvement–Number Among All Ages, 1999-2017. The figure above is a bar and line graph showing the total number of U.S. overdose deaths involving benzodiazepines from 1999 to 2017. Drug overdose deaths involving benzodiazepines rose from 1,135 in 1999 to 11,537 in 2017. The bars are overlaid by lines showing the number of deaths involving benzodiazepines and any opioid, benzodiazepines without any opioid, and benzodiazepines and other synthetic narcotics. 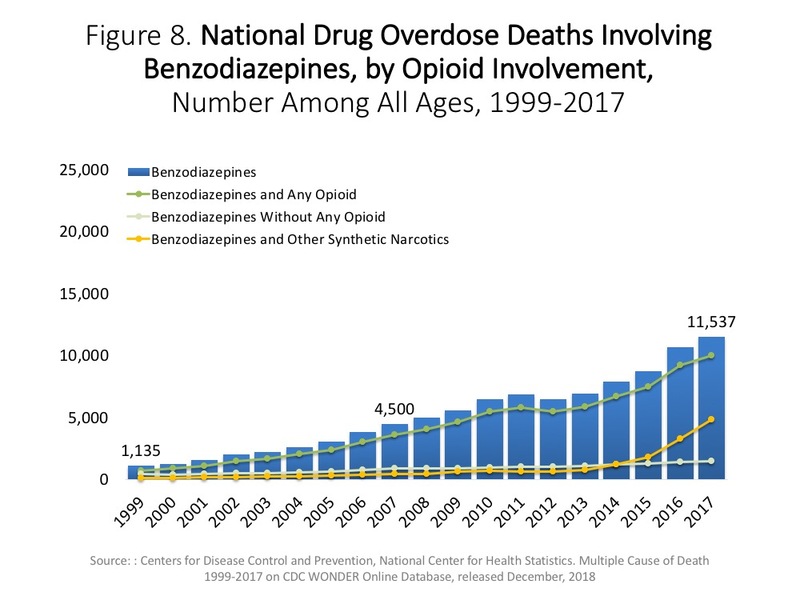 The number of deaths involving benzodiazepines in combination with other synthetic narcotics has been increasing steadily since 2014 while deaths involving benzodiazepines without any opioids has remained steady (Source: CDC WONDER). Figure 9. National Drug Overdose Deaths Involving Antidepressants, by Opioid Involvement–Number Among All Ages, 1999-2017. The figure above is a bar and line graph showing the total number of U.S. overdose deaths involving antidepressants from 1999 to 2017. Drug overdose deaths involving antidepressants rose from 1,749 in 1999 to 5,269 in 2017. The bars are overlaid by lines showing the number of deaths involving antidepressants and any opioid, antidepressants without any opioid, and antidepressants and other synthetic narcotics. 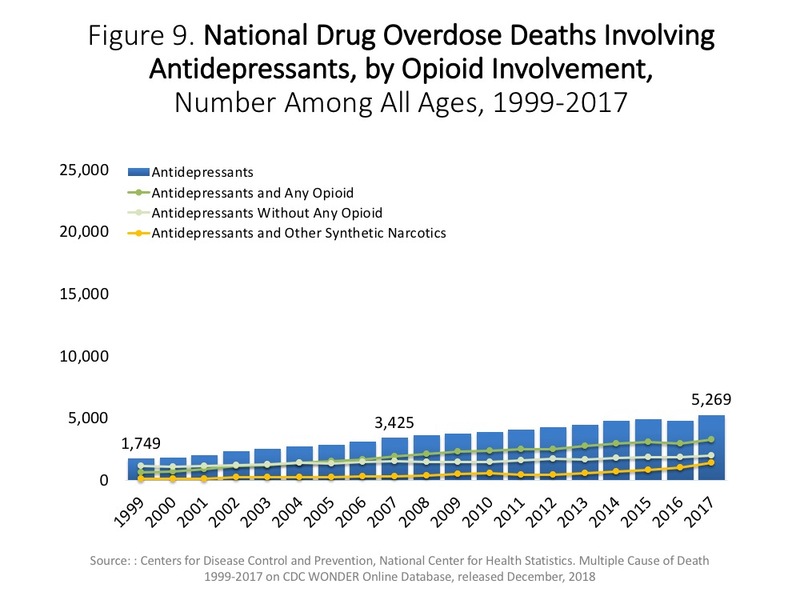 The number of deaths involving antidepressants in combination with other synthetic narcotics has been increasing steadily since 2014 while deaths involving antidepressants without any opioids has remained steady (Source: CDC WONDER). 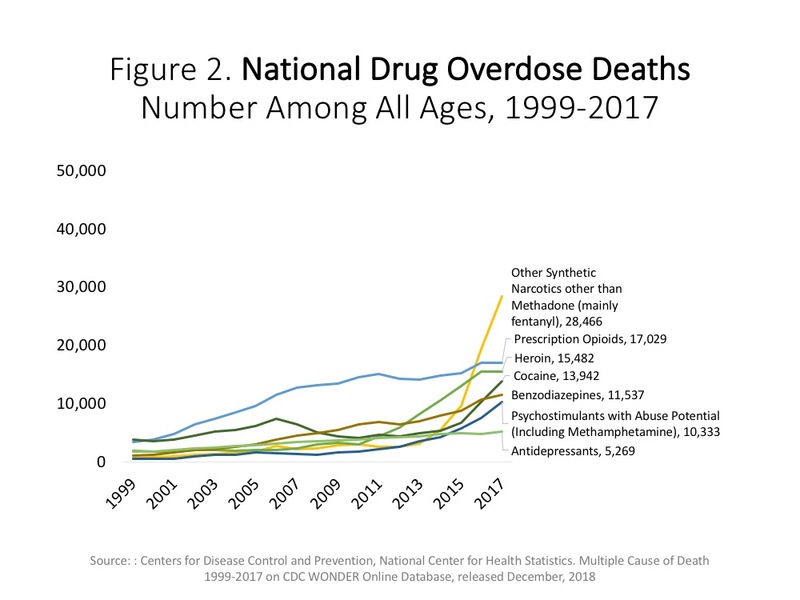 The figures above are bar charts showing the number or rate of U.S. overdose deaths involving select prescription and illicit drugs from 1999 through 2017. The bars are overlaid by lines representing gender or opioid involvement. There were 70,237 drug overdose deaths that occurred in the United States in 2017 (Figure 1), with 66% of cases among males (grey line). The main driver of drug overdose deaths were opioids―mainly synthetic opioids (other than methadone), with a 12.9-fold increase from 2007 to 2017 (Figure 2). Drug overdose deaths involving any opioid―prescription opioids (including methadone), synthetic opioids, and heroin―rose from 18,515 deaths in 2007 to 47,600 deaths in 2017; 68% of deaths occurred among males (Figure 3). From 2016 to 2017, the number of deaths involving prescription opioids remained unchanged (Figure 4) with a decrease reported for deaths involving prescription opioids without synthetic opioids. Overdose deaths involving heroin (Figure 5), psychostimulants (Figure 6) or cocaine (Figure 7) also rose in 2017; however, deaths involving heroin or cocaine were driven by deaths involving the combination of these drugs with synthetic opioids. Deaths involving psychostimulants rose independently from those in combination with synthetic opioids. The final two charts show the number of overdose deaths involving benzodiazepines (Figure 8) or antidepressants (Figure 9). Benzodiazepines were involved in 11,537 deaths in 2017. These were driven by the combination of these prescription drugs with any opioid. Deaths involving antidepressants are also rising, although at a much slower rate than benzodiazepines. As is the case with benzodiazepines, deaths involving antidepressants are mainly driven by those also involving synthetic opioids. The National Institute on Drug Abuse's research-based, informative video series "This Is NIDA," addresses the topic of OPIOIDS.